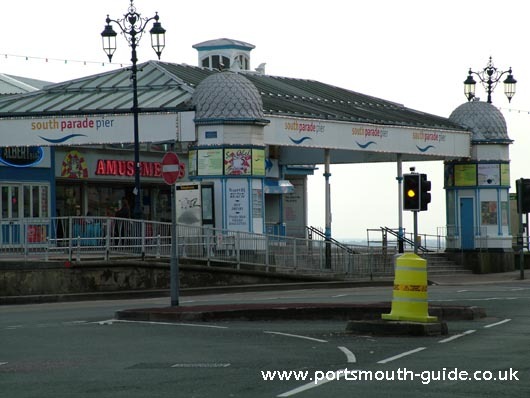 There are many different amusement arcades along the seafront. The two main locations are on South Parade Pier and Clarence Pier. The picture above shows Clarence Pier taken from Old Portsmouth. Clarence pier was built in 1861 and was opened by the Prince and Princess of Wales who attended a concert. Up until 1873 a tramline ran from Portsmouth Town Railway Station onto the pier and was used for taking passengers to the Isle Of Wight onboard steamers. In 1905 the Pier was extended to take extra boat traffic into account and still further extensions were made in 1932 when a café, sun deck and hall were added. After being bombed during World War II the pier re-opened in its present form on 1st June 1961. 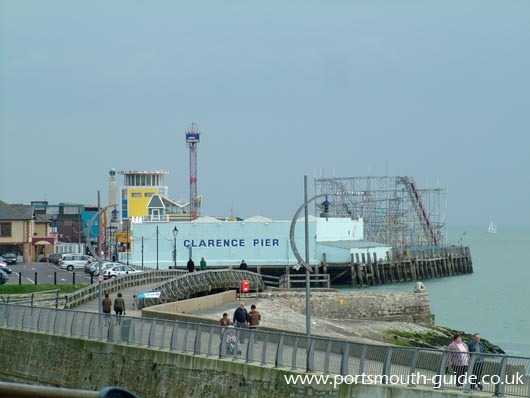 Clarence Pier offers many different rides including; disko ride, pirate petes, the twister, wild river, the power tower, dodgems, skyways, waltzer, formula 2000, gallopers, tea cups and toon town express. The pier also offers amusement arcades featuring the latest video games and fruit machines. The picture above shows South Parade Pier. South Parade Pier was opened in 1879 by Prince Edward of Saxe-Weimer. The pier was intended to be used by passengers travelling to and from the Isle Of Wight. This pier was short lived when in 1904 a fire destroyed the structure. The pier was at this point taken over by Portsmouth Corporation and was rebuilt opening in 1908. It was 600ft long and was intended to be a pleasure pier rather than as before a landing jetty. The rebuilt pier included a large pavilion near the shoreward end that housed two halls, one was a 1,200 seat theatre and the other was a smaller hall. At the seaward end there was a small pavilion that incorporated a bar and lounge. In 1967 a fire severely damaged the theatre, which due to that blaze had to be removed. Another fire occurred on 11th June 1974 during the filming of the rock-opera Tommy. It is believed to have started when a spotlight set light to some drapes, this fire led to a much less grand pavilion being built in place of the destroyed pavilion. It now houses the standard seaside amusement arcades.